Whitley V Z6555 crashed in the North Sea on 9/7-1941. The aircraft belonged to RAF 78 Sqn. Bomber Command and was coded EY-?. T/O 23:03 Middleton St. George. OP: Hamm. At 02:51 the aircraft crashed into the sea some 60 km north west of Vlieland after being attacked by a BF 110 nightfighter of 4. / NJG 1 piloted by Lt. Rudolf Schoenert with Bordfunker Uffz. Hans Richter. The Bf 110 was operating from Bergen. W/op-Air Gnr. 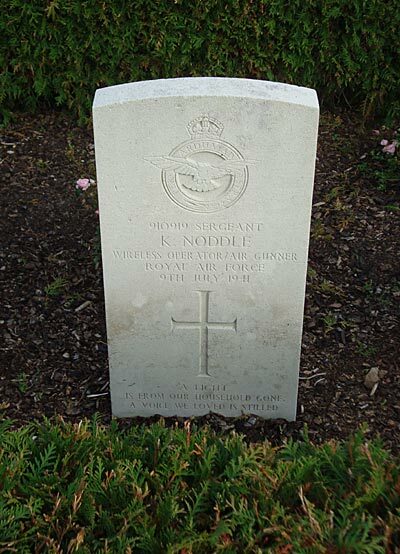 Sgt Kenneth Noddle was found on the beach of Rømø on 15/8 and was laid to rest in Kirkeby cemetery on 16/8-1941. The Parish minister Rasmus Jørgensen and the Marine Pfarrer Müller from Sylt officiated at the graveside ceremony. The remaining crew, consisting of Pilot Sgt Oliver W. McLean RAAF, Co pilot Sgt Clifford Mack Martin RCAF, Observer P/O Herbert H. Mountain and Air Gnr. Sgt Louis Byrne have no known graves and are commemorated on the Runnymede Memorial. Sources : BCL, FAF, CWGC, KK, TW, Richter claim list.